Shop for wholesale DIY craft supplies and let your creative juices flow. 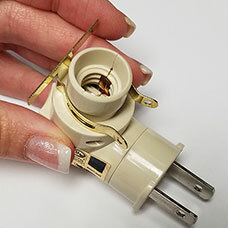 Find plain night light bases, hardware parts, unfinished metal cases, wire bookmark shepherd hooks, blank pill boxes, undecorated business card holders, hinged box blanks, compact mirrors, contact lens cases for arts & crafts projects. Bulk quantity pricing on cases to make your own gifts. 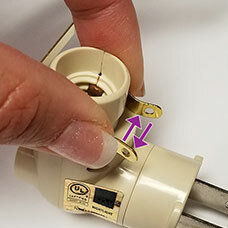 This is the correct way to position a brass clip around a night light base. You will need to firmly press the sides together. 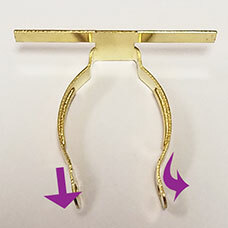 These clips are extra sturdy to ensure they are very supportive, and may require some extra effort to attach to the base. A quick minor adjustment with pliers to flatten out the very end of the clip's arms will make installation easier. Note that the left arm shown here has been flattened out slightly using pliers, while the right arm has not. 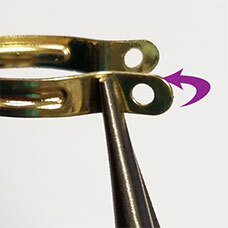 Flatten both sides if you're having any difficulty getting the clip secured to the base.